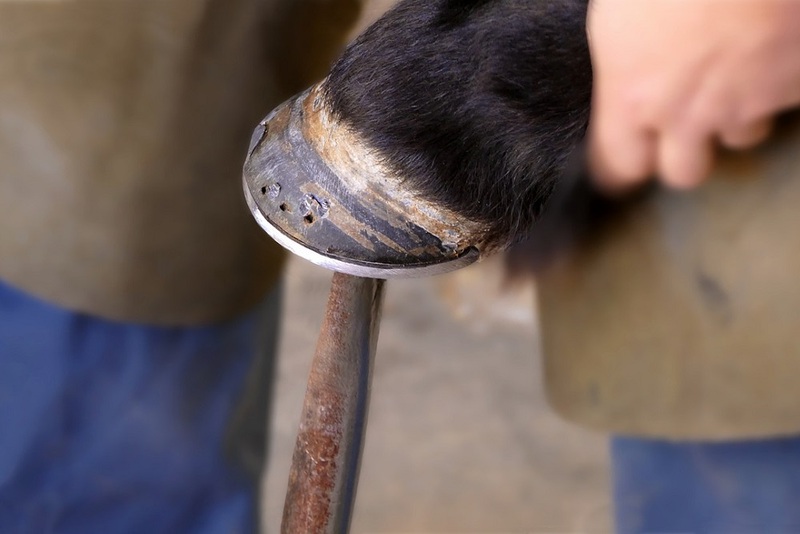 Bad farrier work can certainly injure your horse’s hooves, and that’s why it’s important to only engage the services of a well-trained, qualified farrier who is certified by an accredited institution. Laminitis is a painful hoof disease that can cripple a horse. It is caused by a number of factors, but none of them are acute injury. For this reason, it is not possible for a farrier to cause laminitis. In this article, we discuss laminitis, its causes and symptoms and provide sound advice on preventing laminitis in your horse. Read on to learn more. 2 What Does Laminitis Look Like? 4 How Do You Treat Laminitis? 5 How Can You Avoid Laminitis? The exterior of a horse’s hooves is composed of two layers. The outer layer (horn) is made of keratin and is insensitive. The inner, sensitive layer is called the laminae. This layer is responsible for supporting the hoof’s pedal bone and the weight of the horse. In order to function properly, the laminae must be supplied with nutrient rich blood and oxygen. If it is deprived of good blood flow, it will begin to collapse and die. When this happens, the horse’s pedal bone will sink and rotate. In severe cases, it may even begin to protrude from the hoof’s sole. What Does Laminitis Look Like? Laminitis symptoms come on suddenly and are usually quite severe. Horses experiencing laminitis may refuse to walk or they may even lie down and be unwilling to get up. Horses with laminitis are obviously lame and especially avoid pivoting and walking on hard surfaces. When you examine the hooves of a horse with laminitis, you will find that the digital pulse is increased. You may also notice that the horse exhibits symptoms of pain at the point of the frog. At rest, a horse with laminitis leans back onto its hind feet to avoid putting pressure on the front hooves. This is because laminitis is usually experienced in the front hooves and not the rear; however, laminitis in the hind hooves is possible in severe cases. When walking, horses with laminitis may attempt to walk heel-to-toe to avoid putting weight on the front of the hooves. 1. Too much starch and sugar in the diet. Horses that have a diet that is mostly grain, especially sweet feed, are more likely to develop laminitis. This is because a horse’s digestive system is compromised by these essentially processed feeds. 2. Excess weight can cause laminitis. Horses who are overfed (especially a high starch and sugar diet) are exceptionally prone to laminitis. 3. 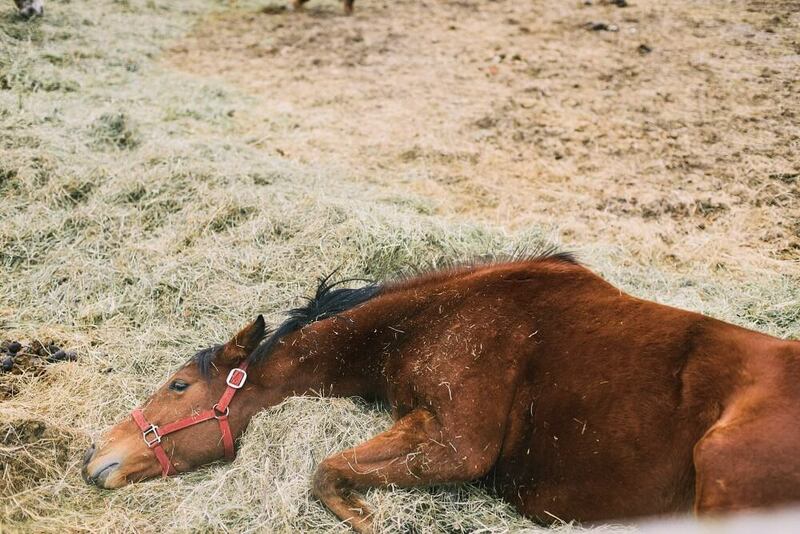 Stress, such as a sudden change in environment, excessive travel, recent foaling or even extreme changes in the weather can trigger an outbreak of laminitis. Horses who are overweight are even more prone to this cause of laminitis. 4. Overwork and trauma can cause laminitis. For example, horses who have been worked at a hard clip over hard surfaces for a long time can develop laminitis due to concussion of the hooves. This type of injury is akin to an overuse injury in people and is not like the type of acute injury bad farrier work might cause. 5. Blood poisoning caused by severe infection can cause laminitis. This may be caused by an extended bout of diarrhea, severe colic or failure to expel the placenta following foaling. 6. Horses who have pituitary gland abnormalities are prone to laminitis. Problems with the pituitary gland cause a condition known as Cushing’s disease. In this condition, the horse may lose or gain weight unexpectedly. He or she may sweat excessively and develop a curly hair coat. Laminitis is another symptom of Cushing’s disease. How Do You Treat Laminitis? The moment you notice lameness in your horse, stop riding or working the animal. Move him or her to a smaller enclosure or stall and pad the floor thoroughly with sand, shavings or thick layers of cardboard. The idea is for the bedding to mold into the sole of the hoof to give support to the frog. Stop feeding grains (especially sweet feeds) but allow your horse to free feed on an unfertilized, mixed grass hay. Be sure your horse has free access to fresh water and a plain salt lick. If you do not have access to this type of hay, you can soak the hay you have in water for half an hour before presenting it to your horse. Rinse the hay allow it to drip dry a bit. This treatment removes quite a bit of the sugar in hay. Contact your vet or your farrier immediately for complete examination and further instructions. How Can You Avoid Laminitis? Monitor your horse’s diet carefully and work closely with your veterinarian and your farrier to devise a low starch, low sugar, low protein diet for your horse. Generally speaking, keep in mind that horses are intended to live on a high-fiber, mostly hay diet. Be careful in your choice of hay. Don’t feed excessively rich hay (such as alfalfa). Instead, keep a good quality of unfertilized grass hay always available to your horse. Feed grains judiciously and monitor or limit turnout time on rich grass. Be careful not to allow your horse to eat grass that has been exposed to frost as this tends to increase the sugar content of grass. Avoid allowing your horse to eat very lush grass, ryegrass and clover. Don’t let your horse graze freely on a fertilized cattle pasture. Exercise your horse regularly and practice good maintenance habits in terms of hoof care. The moment you notice a problem, contact your vet and/or your farrier to correct it.